The legislation has been passed after a few last minute dramas in the Lords and on Wednesday the Prime Minister will trigger Article 50 to start the process by which the UK will leave the EU by March 2019. 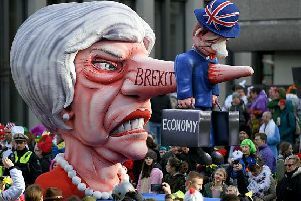 To those who doubted it would ever happen or who still think a second referendum on the first referendum will stop the whole process in its tracks, it is in everyone’s interests if we all rally round the Government getting on with the negotiating process and getting the best mutual deal both for the UK and for the EU which will remain our closest partner after Brexit regardless. This week the consultation over fair funding for schools closed and now the Department for Education (DfE) has to decide how to change the system which has mitigated against West Sussex and many other shire counties getting a fair share of the school funding cake. I suspect the eventual solution which look rather different to the proposals in the consultation exercise such has been the strength of objection from my Parliamentary colleagues. This is all the more difficult when under current spending constraints the size of the cake will not be increasing exponentially. I co-signed a submission to the consultation from all the West Sussex MPs (who are not part of the DfE) raising our detailed concerns and you can see it in full on my website. I am also grateful to the many parents and head teachers who have copied me in on their letters as part of the consultation. I have also made it clear to ministers that I think the priority should be to sort out the funding challenge for existing schools before committing additional funds for new types of schools. I have also posted on my website the minutes of last week’s A27 Working Group meeting chaired by Tom Wye and with some excellent contributions from Peter Phillips of Highways England and traffic expert Stephen Cranford who produced some damning data about air quality at Grove Lodge when the traffic lights were out of operation. I hope to be able to report further news on that soon. The main message at the meeting was that in the light of the Chichester section being dropped it is even more vital that locally we can coalesce around the most practical option or risk a repeat of what happened to the Worthing section back in 1996. Fortunately Transport Secretary Chris Grayling has confirmed that work on our stretch of the A27 continues unaffected. Highways England are likely to publish their proposals after May and in the meantime Sir Peter Bottomley and I continue to lobby ministers to see if the funding available can be stretched if it becomes clear that more will be needed to achieve meaningful solutions including grade separation (underpasses and/or bridges) as I have said all along.